So sorry, so sad, America love you long time. Got a chocolate bar soldier? Why it is none other than the USA. You know all that Ra Ra Boom Dee aye? The United States Army will send a convoy of American soldiers and military vehicles through Eastern European countries near Russia’s western border, despite Moscow’s repeated expression of concern over NATO’s expansion of forces in the region. 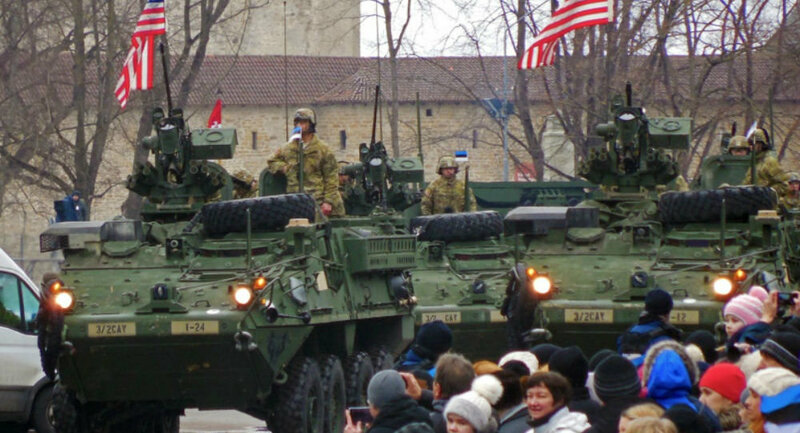 The 1,100 mile journey, dubbed “Dragoon Ride,” will last from March 21 through April 1 and wraps up months the US Army spent training with allies in Poland and the Baltics. American troops from the 2nd Cavalry Regiment will accompany their eight-wheeled armored combat vehicles, called Strykers, while the Army’s 12th Combat Aviation Brigade will provide aerial reconnaissance support.